Appearance:User produces bones from their skin. • Users take half damage from blunt attacks. 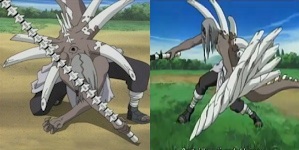 • User may produce a rank of bone they wish to use as a weapon, with the corresponding chakra cost, should they have the corresponding weaponry rank. • All bones share the users health. • One post CD between producing bones for them to grow back. • Bones can only last outside the body for 3 posts before they break down into dust. • Bones are produced at half the users reaction time. 10/20/30/40/50/60 Chakra and Stamina per rank.